Tis the season when I start humming silly tunes without even realizing it. And craving frosted cookies. Please, tell me I'm not the only one! This year, my first year at the White House, I've gone holiday crazy! There's even a bright red bow in my hair. But really...how can I not get into the spirit of things when I'm surrounded by a wonderland of holiday decorations? The day after Thanksgiving, Christmas started to take shape around here. 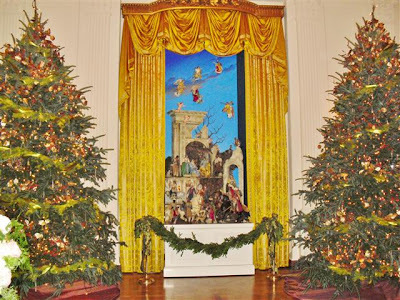 With the assistance of 136 volunteers from 36 states, in just five days the president's residence was transformed into a holiday show-stopper! 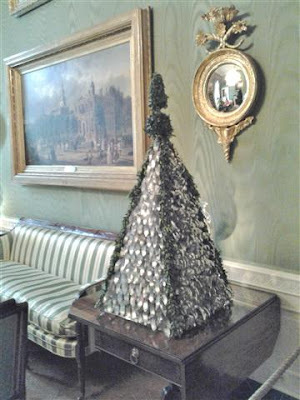 Outside, the national tree stands tall and proud surrounded by smaller Christmas trees representing all 50 states and the territories and protectorates. To the delight of small children, trains race around the tree and through a miniature winter village. And Santa is available to hear secret wishes. Inside the White House, you'll find 37 decorated trees! Some have the traditional paper ornaments. Some trees are even made from paper! And there are even a couple of trees made from recycled aluminum! There's one tree that makes me pause every time I pass by it. The Gold Star Families Tree pays tribute to those men and women who gave their lives in service to our nation. On it hangs photos of fallen heroes and messages from their loved ones. The likeness of the family dog, Bo, makes an appearance in every room. He's made from paper, buttons, and even trash bags. You can even find him waiting to greet visitors at the entrance of the 400-pound gingerbread house. 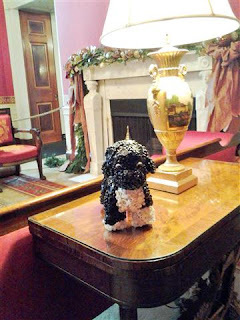 You never know who you might find at a White House holiday open house....occasionally even a mystery novelist will show up! 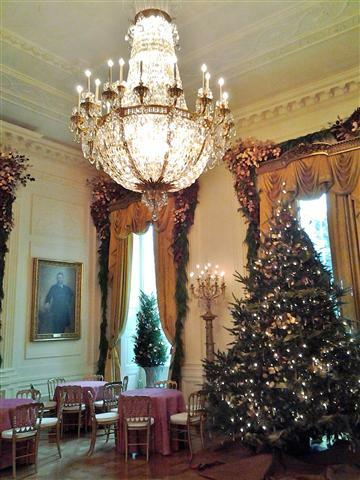 Are you interested in volunteering to help decorate the White House next year? 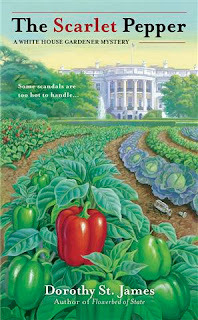 Fill out an application in March at the White House's website. I'll keep an eye out for you! I hope your holiday season is bright and shiny and filled with mystery! Wow-wow! Bo is so lucky. We're going to tell Willow to put replicas of us in every room in our apartment! And a 400 pound gingerbread replica of In Stitches on the floor where we can really appreciate it. Wow-wow! Wow-wow! Wonderful pictures, Casey! Thank you for sharing. My dogs have suggested that I feature a dog bone (edible) in every room of our house. Love taking this tour of the decorations--thanks so much! 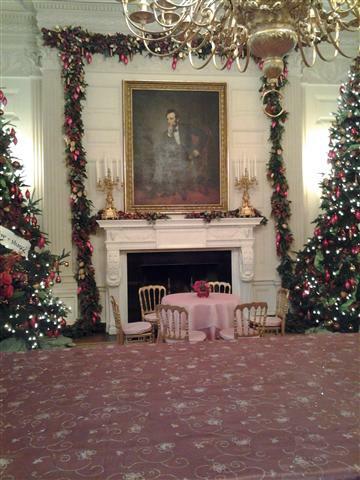 Wonderful peak at the White House decorations. Thanks for sharing. And no, you're not the only humming silly songs! 'Tis the season! All of this is so interesting! Love to see all the trees. Doesn't the gingerbread house look simply delicious? 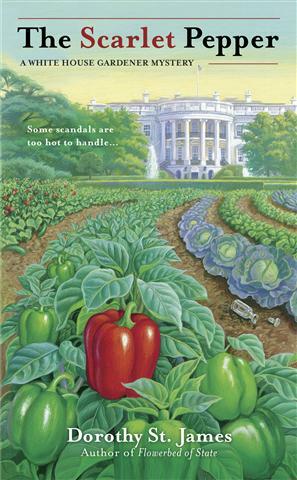 I want to stick my finger in the candy kitchen garden and bee hive that Bo is helping guard. YUM! But I don't think the chefs would appreciate that. In order to have the perfect gingerbread, they start baking it in September. It takes many, many hours to put that white chocolate architecturally-accurate masterpiece together. Sally-Forth and Tally-Ho, you need to get your person to make you that gingerbread house so you can woof it down! You have some smart dogs. 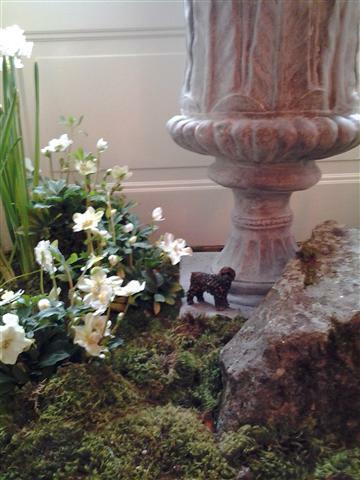 A dog-bone theme would have been better than some silly ol' statues of Bo that don't even taste that good.